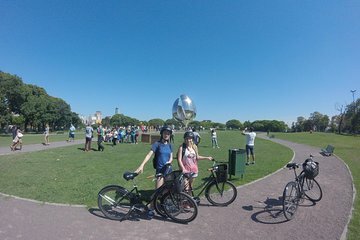 Discover Buenos Aires on this 8-hour bike tour. Sip mate and sample alfajores at the Floralis Generica sculpture. Learn about national history in the Plaza San Martín and the Plaza de Mayo. Explore stylish Puerto Madero and enjoy a sandwich on the banks of the Río de la Plata. See the colorful streets of La Boca, the Bombonera stadium, scenic San Telmo, and the Recoleta Cemetery. This day tour was one of the highlights of our trip to BA. The max size is six people to the tour which makes it very comfortable - this is why we took this tour. We did it the second day in BA and it proivded for a great overview of the major neighbrohoods in the city. It was fun biking through the city and it was not difficult as there are stops along the way. We were introduced to the tradition of drinking mate and eating choripan. Carlos our tour guide was terrific and by the end of the day we felt we had made a new friend. We highly recommend this tour. Perfect way to acquire a great sense of this vibrant city. We covered all the main highlights, learned a lot about Argentinian history and culture and had so much fun navigating the bustling streets. Carlos was a perfect guide. Well informed, patient and a great sense of humor too. Would highly recommend this tour if you want to be more immersed in the touring experience rather than passively sitting on an air conditioned bus.